The road between Eindu and Kawkareik is in a bad way – it turned to mud in the wet season and to dust in the dry season. 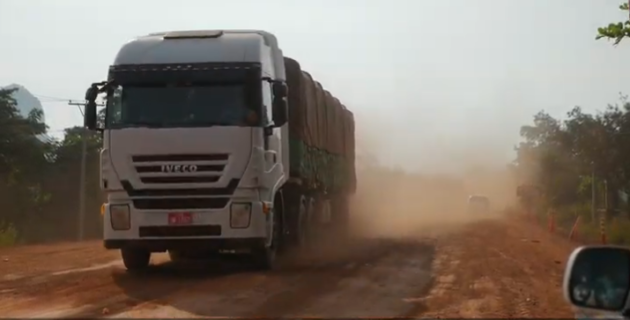 The upgrading works for the 66.4 kilometer section of road connecting the two towns was planned to improve the Asia Highway link of the Greater Mekong Sub-region East-West Corridor. Currently, the construction work has grinded to a stop. The Eindu-Kawkareik road section projects has the backing of a US $ 100 million loan from the Asia Development Bank (ADB) – construction began in December 2016. Local communities protested against the construction company, the Chinese Road and Bridge Corporation (CRBC), for quarrying Lun Nya Mountain, a limestone mountain in the area. Villagers living in the area are concerned the quarrying will have a negative environmental impact. Nan Than Than Lwin, a member of the Pyithu Hluttaw (House of Representatives) from the Hpa An Township constituency, said she would push to get work restarted on the suspended Eindu – Kawkareik Road in an effort to complete it within what remains of the NLD government’s administration term. Speaking to Karen News, Nan Than Than Lwin said. The road construction has been suspended since 2017 and Nan Than Than Lwin asked from local villagers’ to cooperate to help the completion. After the road building was suspended, road conditions worsen as most of the road’s upgrade work is still at the earthwork stage. Local villagers face difficulties using the road and those living close to the road complain their houses get covered in both mud and dust. Nan Than Than Lwin told Karen News that she had raised the issue on January 22 at the 2nd day of the 11th regular meeting session of parliament held in Nay Pyi Taw. She said that U Kyaw Lin, vice minister of the Ministry of Construction responded that they were in consultation with ADB and the Karen State government to resume the road building as soon as possible. According to Nan Than Than Lwin, an alternative source of stones has been found, but permission to quarry the rock is still being processed – the road construction will resume after permission is granted. Eindu – Kawkareik road upgrade worked started in 2016 and was scheduled to be completed in September 2019.